I am Veterinary Medical Officer for NOAA Fisheries, Office of Protected Resources and am based at UF College of Veterinary Medicine through a cooperative agreement. 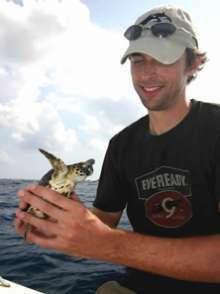 I work intensively with threatened and endangered marine turtles as part of NOAA’s national sea turtle program and am involved with a variety of issues related to health, stranding, and mortality. My work is largely driven by priorities of Endangered Species Recovery Plans and needs of managers. I work collaboratively with many colleagues in federal and state agencies, academia, and other groups. Other professional species of interest include marine mammals, crocodilians, other reptiles, and amphibians. Current and past projects include a variety of infectious and noninfectious disease studies, investigations of animal die-offs, and forensic studies related to human impacts on wildlife.